deemed to be the finest art in the world. protected and as a resulted can only be viewed through a window. Age ring-fort structure, at nearby Kiltullagh. post! Be sure to view this unique bit of history when visiting the farm. 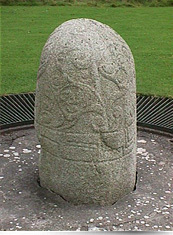 The Turoe Stone was removed by the OPW (Office of Public Works) a number of years ago to be cleaned and to be returned under a weather prove cover, We are still waiting for this to happen. Check here for updates.